Green Parties in Europe have undergone astonishing growth and development over the past decades, but has the time now come to ask ‘Quo vadis’? In this Interview conducted by Michel Genet, Reinhard Bütikofer and Catherine Larrère reflect on the main milestones Greens have passed through during this time, both on a European scale and within their own national contexts of Germany and France, and discuss what paths should be taken in the future and how to communicate the Green vision through the narrow language of political rhetoric. Michel Genet: It’s a very interesting time for political ecology but also a time of challenges – the climate is changing, terrorist attacks have occurred, and Europe is under threat. And some Green Parties, like in France, are struggling. With all this in mind, what is your outlook on the situation, both as practitioners and intellectuals? Green parties have been around now for 30 – 40 years. Are we at a tipping point? Catherine Larrère: I don’t know if we are at a tipping point, but in some ways there are difficulties with the idea of political ecology. I distinguish between what I call political ecology – a party with a project, a model of society that are the Greens, and ecological policies – the fact that governments – especially in Europe, but also everywhere in the world – have ministers for environment and public policies about ecology. There is a conflict between these two ways of connecting politics and ecology because for ministers of environment, their policies are less and less sectorial and more and more holistic. For instance, climate is about the whole of society. It’s not just an aspect. There is a problem with what political ecology is being the object of, and it is all the more difficult in a country like France where the Green Party don’t want to send their deputy to the minister of ecology. So there is a kind of misunderstanding between public opinion and Green parties, as the public expects people from Green parties to act on environmental issues alone whereas in fact they have projects for the whole of society and these issues are just an aspect of what they do. There is a big misunderstanding about that, and this is why it’s not easy to know what exactly political ecology is about. Reinhard Bütikofer: I would not say it’s news that a Green party cannot just be about environmentalism, there have always been other pillars. Still, I would say that presently, Greens are at a tipping point, and it’s a new tipping point. The first phase of the development of Green parties was dominated by the struggle to prove to the wider public that what we were addressing made sense at all, so people were originally ridiculing what we stood for. “Environmentalism?! Are you crazy?! Completely anti-nuclear – are you giving up on progressivism?” Everybody remembers the kind of very fundamental rejection that we first ran into in 1970, and in Germany I would say it went well into the ‘80s. In the history of the German Green party, we got to the first tipping point when basically society started accepting that these guys [Greens] have a point – they’re not right about everything, but they have a point. RB: Yes, that was Chernobyl in 1986. That’s the first time a position that we took as a Green party became a position shared by the majority of the German people. And it’s never been reversed. Ever since then we’ve had a two-thirds majority anti-nuclear in Germany. That was the first point where we were leading the conversation. And up to that point, the kind of politics we stood for was loud, confrontational, aggressive… Because if you want to get the message across – if you’re moderate, nobody will listen. But if we had only continued in the same vein, reiterating over and over again that our issues matter, people would have gotten fed up. So there was a new challenge – and I think that was about survival of the Green political project – demonstrating that we could contribute to help solve some of the problems we identified. That forced us to transform our way of policy-making because if you want to contribute with some solutions you have to find a majority and to strike compromise – and for that you have to differentiate between good compromise and bad. Which is the kind of compromise that empowers you, and which puts you in a dead end? You have to argue and be more scientific. Just beating the drum doesn’t do the job, so we became a different kind of party. This is also happening around Europe. If you look at what the different parties do, this is the second stage, and this is about governing, being a partner in government – be it local, regional or national. Now there is a new tipping point, which is that contributing is not enough anymore. Now the challenge for the Greens is to be a leader that is going to be a political pole of direction that proposes a comprehensive vision for society. It’s clear that the other parties are just not delivering. This forces us, maybe prematurely, to try filling a gap, but there’s also an objective side which is the nature of the problems. Many of the issues highest on the political agenda today are problems that we had been looking into, such as the refugees issue, sustainability, climate change, etc. The failure of the traditional parties is founded in their inability to address the objective reality and the contradictions that are facing us. It’s now our opportunity to lose also or to succeed big. CL: I agree with what you call a comprehensive vision of society and I would say that ecology is the last utopia to exist now. There is no other possible utopia but an ecological one. People need to think that something is still possible. There are still open opportunities and possibilities – whereas Margaret Thatcher was saying that there is no other alternative (TINA). It’s what people are dying with, that our so-called socialist government is telling them in France. There is no alternative – it cannot be done otherwise. People need what utopia is about: possibilities, opportunities, alternative. Ideally, Green parties should show the way towards this utopia; this comprehensive vision of society with possibilities. I’m not sure they’re up to that. RB: I wouldn’t call it a utopia, but a vision. I agree with your criticism of the technocratic, bureaucratic approach. Populist movements, on the other hand, act as if there was no reality to be accounted for – as if political will was everything. And when the technocrats say that political will doesn’t work, it’s equally negative and those inimical brothers are killing democratic deliberation. That’s what we’re encountering now. In addition to the visionary, can-do dimension, yes, when Merkel said, “Wir schaffen das” – we can manage – that went down with Greens quite well. Yes, we can, we can do better, a different world is possible. But then we also need a second element which is making people feel at home. I believe that this is a major challenge. An increasing number of people don’t feel at home in the present circumstances that they are confronted with. If Greens ignore that, if they don’t focus on the change-agent role that we have and don’t take account of this second element, we will also fail. So that means that the visionary aspect you were talking about it is kind of wrestling with the feeling of the people? RB: No. I say it has to be combined. In Baden-Württemberg, where we just won big, the Green prime minister used the phrase ‘Heimat and high-tech’ to describe his policy (Home and high-tech). We don’t want to choose between the modern world and the world that we feel at home in. We don’t want to put them at odds. How can we integrate that? We know the vision we are offering people is not always an easy one, because we are aware of the limits of the planet – not only climate, but biodiversity, resources and so on. Isn’t it a paradox to make people feel at home if we are saying we also have to change the model? CL: We, the people, need a message of hope, another vision – an alternative. Yet the main discourse presently is about business as usual. We had COP 21, which was a big success, and yet somehow things still go on the same way. In France, we’ve seen a new airport being built at Notre Dame des Landes, fossil fuels are still subsidised and on the other hand, Greens and people related to the environment are talking about catastrophe and how everything is going to collapse – what can be called ‘collapse-ology’. Collapse-ology and business as usual are two sides of the same coin; it is about to happen at any moment, and you just do nothing. RB: This is where we are in danger of failing the people. I believe this is just intellectual laziness. To say that everything collapses means we don’t look hard enough for the ways out. CL: But which are the ways out? RB: Well, take your example of COP 21. I agree completely with you that this was a great breakthrough, but in one single sense: it ended up defining a direction in which everyone is supposed to go. Up until that agreement, everybody was zig-zagging and moving back and forth all the time. Now the train is on the rails and we know into which direction it should go, but nobody knows yet when the train will start moving, whether it will move fast enough or whether it will move so slowly that it will arrive only once the train station has collapsed. Now the question is about speed, willpower, political energy. I’m not at all put off by the negatives that you rightfully mention. 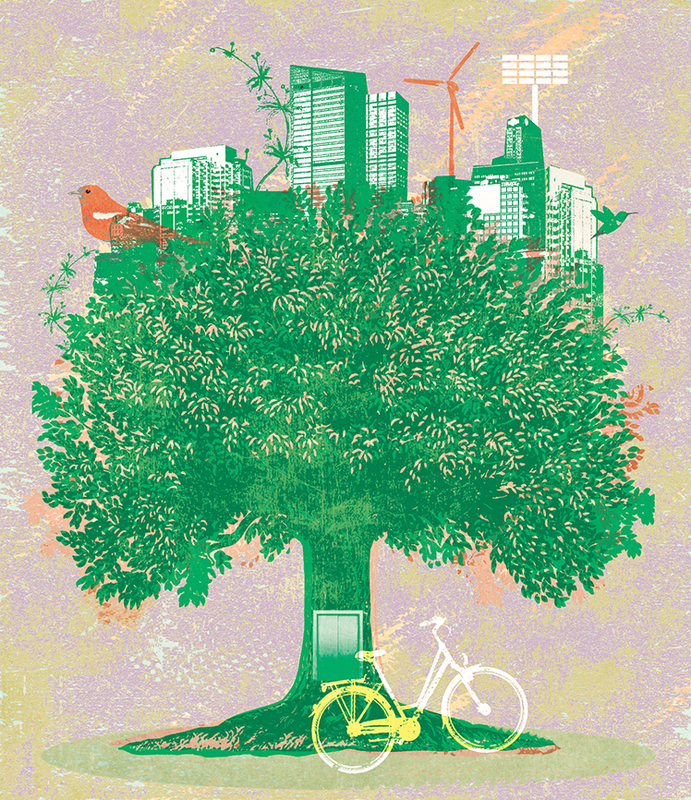 There are forces that can help move the agenda of the Green, economic transformation forward. One is civil society engagement, and there I’m betting a lot on the carbon/fossil fuel divestment movement, which asks why people should continue to profit from destroying the very basis of societal reproduction. It’s wrong and economically it makes no sense either. This is a strong combination: ethical and financial. So the movement is growing very fast and is re-politicising the climate policy. Previously our climate policy was just educational, giving people cold, scientific arguments, and assuming that because of these everybody would join us. That’s not how it works. There are enemies, there are people who profit from going exactly in the opposite direction, and if you don’t fight them, you don’t win. This movement re-politicises, because it identifies the major carbon emitters as the enemy we have to fight. But if we’re talking about a civil society movement, what role do we as politicians, as a political party, have to play in this fight? Is it about taxation? Carbon tax? Regulation? The governments have also a responsibility. It’s not only about cooperation. Or is it? RB: The beauty of this movement is that it does not rely exclusively on state action. It uses the market mechanism to fight our enemy. That means that if I tell the public that this bank is heavily invested in fossil fuels, and that it is causing a carbon risk to all their investors, and if you are a smart investor because you know that at least that two-thirds of all fossil fuel resources have to stay in the ground if we don’t want to exceed the 1.5 degree limit then all those who invest in fossil fuels will end up in a classical financial bubble. It is already happening in the market place. So you don’t have the only option of winning an election and having the next five years to draft law; you can even lose the election and still carry on fighting on the social level. That creates more mobility, and the role of the party is to help provide such a movement with all the tools it needs to be successful. The party as a servant to the movement. That’s the way in which a party exerts power. And leads. CL: We could debate when you say it’s not a matter of markets, and there is a kind of shift in financial investments from fossil to non-fossil. But you know, you have no market without regulation and you have no regulation without states, and if states were not subsidising fossil so much then finance would shift quicker. But I also wanted to ask another question. It’s very important, of course, what happens between governments and markets and financial hotspots, but what about the people? It’s not only about the economics of a financial shift, but also in a way people need to change their way of living. You won’t succeed in this particular climate change venture only with financial change; you need a switch in the way people conduct their everyday lives. RB: That’s precisely the strength of the movement. For instance, when we initiated the policy of promoting renewables in Germany, what we did was not just to offer technological solutions, but we also changed the power relations and made the people powerful. Because we allowed people to become a new entrepreneurial class, everyday citizens were allowed to invest into energy alternatives, and it became a broad citizen movement of mutualities, collective investment, and all of a sudden the big utilities lost the dominating power that they had exerted over the country for 50 years. In the divestment movement, similarly, people play a role. CL: But what kind of role? People asking their investors… is it enough? Don’t we need also to change the paradigm at the local level? The problem is that people are doing lots of small things, consuming local, having gardens in the city, many things like that. If they remain isolated experiments, they will have no result. Political forces need to work to generate critical mass. For instance, in France, a movement like Alternatiba or movements in networks are very powerful, whereas traditional political parties are top-down ideological forces and there is much to learn from these networked, horizontal forces. RB: I agree. Whenever there is an alliance of such forces, however weak they may be in the beginning it makes everybody stronger. I’m not saying that the fossil fuel divestment movement is the only movement on which I’m betting, but it is presently the fasting growing and most powerful climate movement that we have. This is why I advocate that we Greens strongly support that. We’ve seen the impact of big advocacy movement like 350.org, and the success of local solutions and initiatives. There seems to be an increasing gap between social movements, some of which are seen as anti-politics, and political movements. We are 30 – 40 years old as Greens, and we are seen as being part of the establishment. So why do we need the Greens? RB: Whether such movements move forward fast or slowly depends also on the framework conditions. If you have an economic framework that highly subsidises fossil fuels, it makes it much harder to turn the corner. That’s the role of a political party: to learn from the movements; to learn whether the framework conditions have to be changed and now to empower those movements and then to cooperate with them – not by telling them to do this or that, but by using our understanding of how politics, the state and the economy works to change conditions. This is the role of the Greens. CL: What I see in France is that there is a gap between what lots of local activists do, who are very active and do a lot, and parties. It’s a question of trust, and it is lost. This is what I experience and see every day. Recently, in the South of France I was in an anti-GMO meeting with activists who were extremely good – they were conscious, active, and so on, but they mistrusted not only the Greens but politics and parties in general. For me, it’s abstract. So it’s up to the Green party to serve the movements? Is there a change in the paradigm of the Green party, in particular in Germany, away from institutionalised politics? RB: In many parts of Europe, including in Germany, we are not as much of a change agent as we should be. We don’t command as much trust as we should. It can be seen in the polls. This is obvious: we all have to do better. But I’m old enough to have experienced another phase a couple of decades ago when people were desperate with politics. That was the end of the ‘60s and beginning of the ‘70s when a lot of the younger generation did not trust the parties that they found at their disposal, and some of us went into radicalism, like myself at the time. Most of that failed and after a while, the Green option became the answer. It is by no means a given that under the present circumstances, Greens will continue to be relevant if they don’t answer the issues. For the younger generation then, the socialists were not an option anymore. They had lost their credibility. If that happens to us, we might suffer the same fate. But we can also succeed. Look at Baden-Württemberg. CL: But I’m not so sure that the analogy of the ‘60s and ‘70s works very well – at the end of these eras, there was something like hope for the future and this hope is no longer there. Despair is what I feel with local activists that I meet – it’s different from the trust of the young activists in the ‘60s and ‘70s. We cannot be satisfied with the idea that it happened once so it could happen again – of course things go back and forth. Why is despair greater today than back then? CL: Because there is no hope for the future – catastrophe is looming. RB: I totally disagree. I look at what some climate and environmental activists do – small groups of people – going out there and making their case as if they knew that at a certain point in the future they would attract large audiences. That is the expression of hope. Maybe we could say, following Gramsci that there is a pessimism of the intellect, but certainly there also is an optimism of the will. This is still around. I see that when I go out there. There are a lot of movements emerging – for example cooperatives among farmers or in the energy sector, there are little villages and cities with a good framework that allows them to be independent and produce their own energy. These kind of transitional movements – people who come together on a platform – this is for me civil society organising itself. So when, in Baden Wurttemberg, you talk about ‘Heimat and high-tech’, is this the narrative for the future that we Greens have to offer the world? CL: I don’t think we can speak of ‘Heimat’ in France – our identity is too much in question so we cannot rely on saying that. This is not a tactical question, for me it is an issue of principle. RB: Well, Heimat in Germany is not a notion that describes the nation. It’s translated in English as ‘home’ and it’s more identified with regional or sub-regional entities. It’s an emotional concept. It’s about a feeling of wellbeing, in a very general sense. It’s not defined economically, but emotionally and through conviviality. It’s quite open. Migrants can be part of the Heimat. The region where I come from has probably been more integrationist over the years than many others and has accepted people from all kinds of ethnic backgrounds and integrated them. RB: Two words are never sufficient to describe a strategy or policy, but this phrase points at the task of building a bridge between where we come from and where we want to go. We don’t have to choose. High-tech is not just about technology but also about opening – Baden-Württemberg is a very export-oriented economy, so high-tech is about being connected to people from other parts of the world. This is about a combination, and to put it provocatively, it means combining elements of conservatism and elements of progressivism. CL: Well, Heimat is a very conservative notion, isn’t it? RB: The Marxist philosopher Ernest Bloch made use of the concept of Heimat, and in his usage it meant ‘where nobody has been yet’. It’s a place of dreaming or of longing and projection so that’s not just a conservative project, but indeed the conservatives have controlled that concept a long time. Part of the success of the Baden-Württemberg Greens and the German Greens in general has been our ability to take issues away from the conservatives. Nature conservation, childcare, consumer protection – these should’ve been conservative issues, but they are all Green issues in Germany. This is something that makes us stronger. In order to win and to dominate ideologically, you have to find ways of taking away some of the strong points of your opposition, and this is what this approach does. CL: I would still not say Heimat and high-tech. We need to learn to live together – conviviality of life. With the migration crisis, we don’t know what we are anymore. As Europeans, we have unfortunately shown that we are no longer able to live together and a party should be able to show people how to live happily together. Maybe it sounds a bit silly but I think it’s important. RB: I think the European Greens should look at successful examples more broadly. Such as Eric Piolle in Grenoble, Caroline Lucas in Brighton, Winfried Kretschmann in Baden Wurttemberg, Pekka Haavisto in Finland and so on… Look at examples where Greens have been successful in running beyond the 15% threshold. I don’t believe there is a one-size-fits-all or that everything can just be bought from the shelf. You have to have innovative solutions in all the different contexts but the challenge is to move beyond your comfort zone. When he was elected as leader, Sigmar Gabriel, leader of the German Social Democrats, said: “We have to go where it smells bad” – where it’s tough, where people don’t trust us, move beyond our comfort zone. If the traditional left doesn’t do it that’s our Green chance: If we don’t do it either, we will all end up being conquered by the populists.